Although it was Sunday the feast of the Trinity, the winemaker Augustus Arnaud worked in his vineyard. 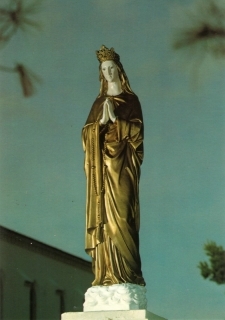 Suddenly, according to local legend, Augustus saw a bright light in the middle of the field and came and saw that manifested itself in that light the figure of the Blessed Virgin Mary, she attracted the attention of the farmer on Sunday rest and urged him to erect a cross, to place a statue of the Madonna in the vineyard and venerate with his neighbors. Exactly one month later, she reappeared on the cross, which had meanwhile been erected with a devotional spirit, and said to all the people: "You must never work on Sunday! Blessed are those who believe." In 1876, the diocesan bishop, Bishop De Cabrières, after the establishment of a commission of inquiry and having questioned several times the seer, he recognized the supernatural origin of the apparitions. Our Lady reportedly appears to Auguste Arnaud, a man in his thirties, married with two children. He didn't faithfully attend Mass on Sundays. Auguste Arnaud went with his father to the parish priest who didn't beleive him. He then went to the carpenter to order a wooden cross and planted it at the bottom of the vine at the place indicated by the Blessed Virgin. With his family, he went to the hermitage of Saint Anthony the Egyptian. He made a pilgrimage to Notre-Dame de Gignac where he went after the Holy Mass the rest of the morning praying. He replaced the wooden cross planted in the vineyard by an iron cross that was mounted in a stone pedestal. Our Lady appears for the second time: Arnaud started working in his vineyard where a crowd of 400 to 600 people waiting. He went to work and take a break. He again took the tool that slipped from his hands. He sat up and grabbed his hat and threw it aside. At the same time as his arm rose into the air, his face became very pale, his hands seemed inordinately elongated, his eyes fixed on something only he could see. He was suddenly moved with lightning speed to the cross (a distance of more than 40 yards.) None of the witnesses rejected this extraordinary fact. This time, the lady was dressed in clothes of gold. As during her first visit, she spoke in his dialect: "Do not work on Sundays. Blessed is he who believes and unhappy man who does not believe. We must go in procession to Notre Dame de Gignac. You'll be pleased with your entire family. " She slid her rosary on her left hand and his right hand, she gave the benediction: "Let us sing hymns. " Bishop Cabrières appointed a commission of inquiry to investigate the apparitions. The commission recognized the authenticity of the apparitions. But the vicar general remained in opposition to this commission. Thus, the pilgrimages began without official recognition. Auguste Arnaud dies. He is buried in the fileds of the apparitions. "It was around 7:30, I saw a young woman shows all dressed in white, she wore a fringed belt and her head was crowned with a high crown like a miter. A great white veil came from the top of the crown covering her hands crossing on her chest. The figure of the woman was beautiful, quiet, without expressing neither joy nor sadness. I have not seen him smile. She seemed to be between 25 and 28 years." 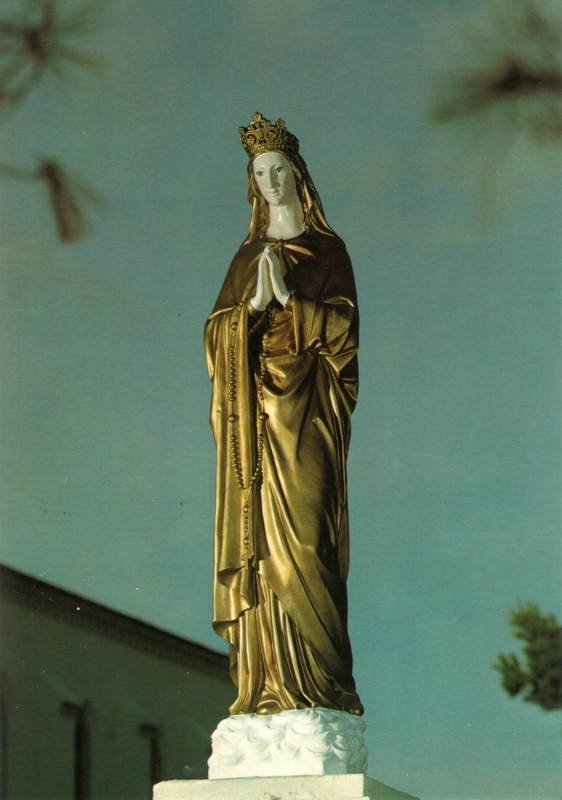 During her second apparition, Our Lady was dressed in clothes of gold. opposition to this commission. Thus, the pilgrimages began without official recognition.